Thank you for your question, for the printer model Samsung ML-1510 you would require the Compatible Samsung ML-1710D3 Black Toner Cartridge (Replaces ML-1710D3-SEE Laser Printer Cartridge). If you require any further information, do not hesitate to contact us. Is the cartridge which you have on the internet a new cartridge or reconditioned? Secondly, is it a refillable cartridge as I have a bottle of black toner? We stock both the genuine Samsung cartridge and a premium brand recycled cartridge for this printer. The genuine black Samsung ML-1710D3 toner cartridge is the brand new OEM cartridge. Our compatible black Samsung ML-1710D3 toner cartridge has been remanufactured. Unfortunately, neither of these cartridges are re-fillable and we advise you not to refill laser cartridges unless you are an expert as the toner powder can be hazardous. The Samsung ML-1510 is a pleasing mono laser printer that can be purchased at a very reasonable price. The ML-1510 is ideal for use in small or home offices and will print black and white copies at 14ppm. Samsung have equipped the ML-1510 with a 250-sheet paper capacity and 50-sheet output tray whilst print quality is consistently crisp and clean. When you purchase the Samsung ML1510 laser printer you get a 1,000 page starter toner but inevitably this cartridge will soon run out leaving you to find a replacement cartridge. Before you rush out to the high street you may want to consider the prospect of buying cheap Samsung ML1510 toner cartridges online. Choose from a range of original or compatible black Samsung toner cartridges and see how much you could save today. We offer free next day delivery when you buy Samsung ML-1510 toners to save you time and money so why look anywhere else to get your cartridge? We are also extremely proud of the excellent build quality of all our cartridges and it is very rare for our customers to experience dissatisfaction. For extra peace of mind and to underline our commitment to customer care we accompany every single order with a money back guarantee. For unbeatable prices, speedy delivery and award winning customer service place your order for Samsung ML1510 laser toners here at Cartridge Save. The Samsung ML-1510 is an entry-level laser printer. Printing only in black and white, the ML-1510 is ideal for use in a small office offering fast printing, large paper capacity and solid print quality. 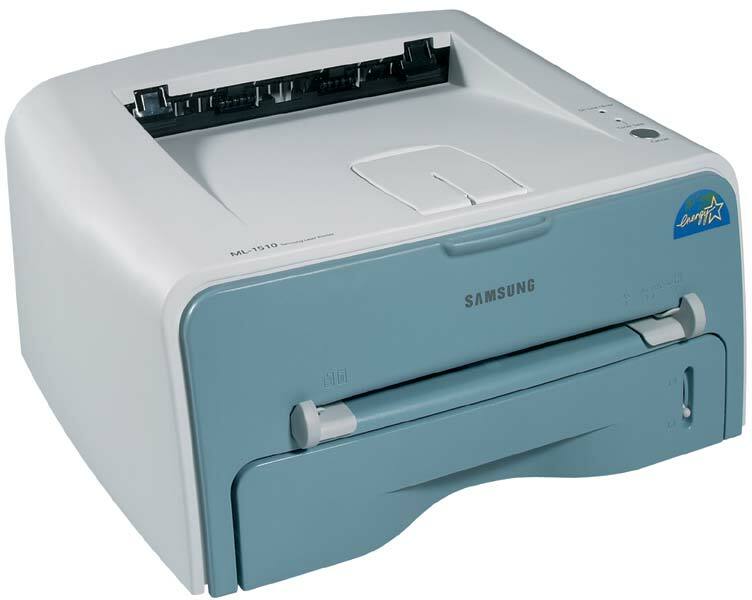 The Samsung ML-1510 is larger than most entry-level laser printers. While most comparable printers do not hold more than 50 sheets of paper in their tray, the ML-1510 holds 250. Also notable is the simplicity of the design. Unlike more complex designs, the Samsung ML-1510 only has a single button on the entire unit. The designers have made it as easy as possible to replace any used Samsung ML-1510 toner. The Samsung ML-1510 is an excellent simple printer at 600 x 600 dpi, the print quality is good enough for text documents. A fast 14 pages per minute will make sure that even your larger printing jobs are done quickly. Despite the fact that it works quickly, the ML-1510 also works incredibly quietly making it ideal for smaller workplaces that cannot allow annoying printing noises. Also notable is the ease-of-use. Easy installation and use make the ML-1510 a good choice for those who want a quality, reliable printing solution without the hassle. Finally, as it is a popular model, you can find cheap Samsung ML-1510 toner at Cartridge Save. There is very little to complain about when it comes to the ML-1510. The simplicity of the design and lack of high-end functions will likely frustrate advanced users with very specific printing needs and the printing quality is substandard when printing images. However, this is more reflective of the price point than the quality of the printer itself.